"I am an extrovert under the right conditions. If you put me in a room full of grownups, I’m a total wallflower. I’m just not all that interested in talking about stock portfolios or politics or other 'grownup' things. I tend to tune those things out and retreat into my own little fantasy world. But put me in a room full of geeks or book people, and I miraculously morph into a wisecracking spotlight hogger. It’s my superpower." - Carrie Harris, author of Bad Taste in Boys. "I can't write what anyone 'suggests' that I write. I can only write what excites me in that strange, unfathomable way. And I'm slow!" - Maurissa Guibord, author of Warped. "I can be a lot more business-minded than I ever would have guessed!" - Hannah Moskowitz, author of Invincible Summer. "I’ve learned to trust myself and to be patient with myself. I sometimes write myself into a corner, and I used to panic when that happened. I also used to panic when I didn’t know how to get from point A to point B in a manuscript. I now know that if I let things be for a while, a solution will present itself. For instance, in On Etruscan Time, my main character had to travel to the past to save an ancient Etruscan boy from being executed for a crime he didn’t commit. I had already set it up that a time-traveler couldn’t speak to anyone or move objects in the past (to get around the paradox of someone, say, killing his own grandmother as a child, thus preventing the time-traveler from being born, which would mean that the person didn’t go back in time and kill his grandmother, which meant that he was born . . . ). I lay awake at night a lot trying to figure out how Hector could help the Etruscan boy. 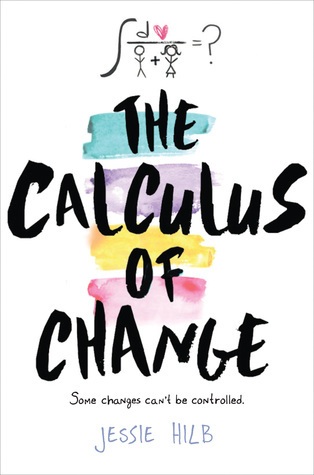 I found that I had already, whether consciously, unconsciously, or merely coincidentally, written the solution for that conundrum into the manuscript." - Tracy Barrett, author of King of Ithaka. "I’m someone who refuses to talk themselves out of succeeding, and that’s a huge factor in actually achieving success. (Of course 'success' means different things to different people, but I’m talking about my own personal standard for myself.)" - Cynthia Leitich Smith, author of Blessed. "Resilience. Every time I think there's something in this business that I can't possibly do, I figure out a way to get it done. It's like problem solving overdrive everyday as a writer!" - Gretchen McNeil, author of Possess. "That I can do this. Which might sound ridiculously simple, but really, it's everything. Writing is a creative pursuit that takes both discipline and inspiration--both in large quantity, if you want a career. I'm very grateful that I've turned out to be good at handling this as a career and not just a hobby." - Jaclyn Dolamore, author of Between the Sea and Sky. "I am terminally insecure, but also respond very well to praise. (Go ahead, tell me you love my book -- I'll be forever grateful!)" - Inara Scott, author of Delcroix Academy: The Candidates. "For most writers, it doesn’t happen overnight. There’s a lot of rejection and heartbreak and what it really comes down to is…how bad do you want it? This has been a long journey for me. Writing was what I always wanted to do, ever since I was a little girl. And I am, let’s just say, MUCH older now. And it definitely did not happen for me overnight. There are trunk novels that will never see the light of day. I could wallpaper my bedroom with rejection slips from my twenties. But I learned a lot about myself, motivation, and perseverance." - Kim Harrington, author of Clarity. "I am a lot more persistent and thick-skinned than I ever thought I could be. If you'd told me 15 years ago that I would have written 4 full novels and have one on its way to publication, I would have said you were crazy!" - Sara Bennett Wealer, author of Rival. "That I really can do the things that matter to me, the things I'm willing to work and fight for." - Stacia Kane, author of City of Ghosts. Come back Thursday to find out what the rest of the authors have learned about themselves on their journey as writers. The authors have donated a bunch of books and swag for a few lucky readers to win. Take a look! So here's the skinny... There will be three winners. Grand Prize Winner: Five books of their choice, signed Desires of the Dead poster, and various signed and unsigned swag. 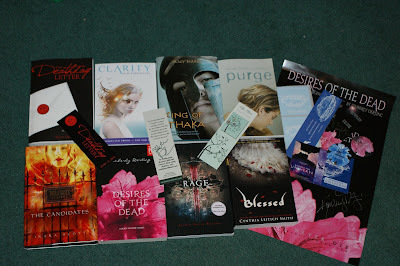 Runner-up: Three remaining books, signed Desires of the Dead poster, and various swag. Third place: Various signed and unsigned swag. Fil out the form below to enter. Good luck! Loving these interviews! The quotes from some awesome authors on various topics are really insightful. Thanks! It is so inspiring to hear what makes an author tick! Would be delighted to win any of the great offerings. Thanks! I totally get what Carrie Harris is saying because I feel the same way. This was a really great question, and I loved their answers! Each one was very unique, but they were all inspiring! Beth Revis's story is definitely hugely inspirational. It's a reminder for the rest of us to keep plugging. I loved Hannah's answer about business. Even with just having a blog with business and professionalism side of things scares me at times! Great question!